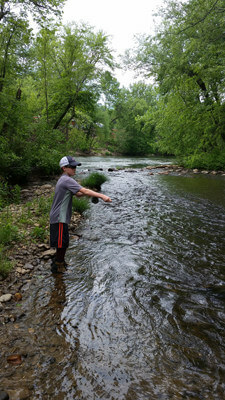 This past few months have been an exciting time for teaching my oldest son Connor one of the most important attributes of fly fishing which is learning to crack the code trout fishing. This has helped him immensely to avoid the many failures I had made over the years which equate to him having greater successes on the stream. The most important thing for a kid learning to fly fish is the FUN factor. Fly casting and rigging on the stream are the easy part in trout fishing. Most surveys have these two disciplines at the very top of the list why the sport of fly fishing intimidates newbies. Best to begin with some sort of foundation casting to help prevent frustration down the road. We have to embrace the frustrating realization that all of us will fail at times! We had better make friends with our reaction to fail, learn from it, and move on! You see fail is an acronym for First Attempt In Learning! The masses of tourist in the springtime here heading off to the river provide classic examples of what not to do when fishing new waters! Most of them flock to the nearest place that sells flies and think their successes are directly related to fly pattern! Just imagine how silly that is that the masses believe they have techniques and tactics already learned, water type figured out, and the magic fly tied on the tippet! 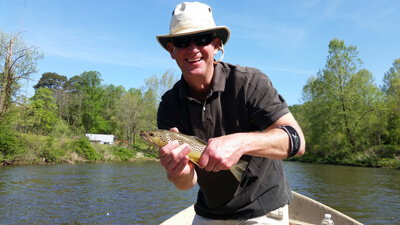 Fly fishing Bryson City, North Carolina offers vast opportunities for wild trout and Delayed Harvest waters. Just imagine how silly that is that the masses believe they have techniques and tactics already learned, water type figured out, and the magic flies from the local fly bin! Nothing could be further from the truth for most examples when on the stream. Presentation of technique will always triumph over fly pattern. As light conditions, water clarity, time of day, etc… change we often change fly pattern more according to weight than worrying about what is hatching. Most waters here in Western North Carolina have trout feeding opportunistically throughout the day. Trout feeding behavior likes to sample the drift on stream which means you should have a few nymph patterns in varying amounts of weight, dry flies, wet flies, and streamers. Sample the drift implies that yes they put your fly in their mouth to sample it for taste, action, texture, and who knows maybe they are just hungry! Spring is a magical time in the Smokies for aggressive trout feeding in the wild. It is typical to have triple-digit days with trout on guided trips this time of year. Important for folks to realize that as a guide we can not predict it in advance and there is no magic fly! We can teach and assist you in learning to crack the code trout fishing so that you raise your skill level on future outings. Many folks find it difficult to believe that most guided trips tend to be more productive with new folks over seasoned anglers. Not the top level elite fly fishers but the ones who have been self-taught for most of their journey trout fishing. I tend to view rigging and casting as the mechanics of the sport which can be learned rather quickly through a proper foundation in the beginning. The real fascination for me though has revolved around cracking the code when trout fishing. Observation is key for this to take place in the stream. Kind of like working a puzzle! When I think of the really top level anglers I have met over the years, they have a very keen sense of observation and understanding of fish behavior. Cracking the code consistently while trout fishing requires that you learn from your mistakes early on as a fly fisher. If you do not embrace the failures each and every outing then how are you to improve? The water types the fish hold in change throughout the seasons and even through the day. Once you know the water type then it is actually quite simple to determine if the fish are holding near the surface or tight to the bottom. Next, you will begin to have clues that teach you about the behavior of the trout. How close can you approach and in what type of water? What type of action or lack of action does the fish want for the day? Is fly action determined by hatches, mood as it relates to conditions or both? This cracking the code trout fishing still fascinates me as much today as it did when I was a kid! This puzzle is most easily solved by keeping an open mind and willingness to change up tactics or rigging as your instincts dictate in the moment on the stream. Angling pressure changes this as well because the fish do not find it a pleasant experience to struggle daily from being caught. 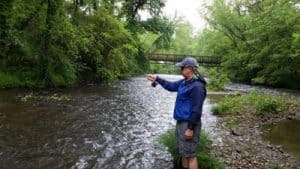 In coaching fly fishing over the years we often talk about water types as A, B, C, and D waters. These do not always remain the same when angling pressure increases on a resource. One day the A water might give up three dozen trout on our local Delayed Harvest water. You can see those numbers diminish if you keep working the same water daily. The trout disperse and begin holding in the D waters once the others have been exhausted on a daily basis. So over time, the C and D water changes into the A and B waters. You have to fish in the moment and figure this out each and every outing! If you are lucky enough to live close to a trout stream then you are fortunate! Learn to fish the same section of stream often that has shallow riffles, pools, pocket water, and areas with plenty of cover. I have a few places on Deep Creek in the Great Smokies National Park that I fish regularly through the winter months. The lessons that I pick up from going to the same water also end up being a great study for how angling pressure causes fish to move around. Tight lines and happy fishing.